The curtain is coming down on “The Greatest Show on Earth.” The owner of the Ringling Bros. and Barnum & Bailey Circus has announced that the show will close forever in May. Thanks to animal activists all over the country who helped make this happen! It took a village and here in Minnesota, ARC has been chipping away at this archaic institution since the 80’s with billboards, letters to the editor, demonstrations, and handing out thousands of brochures, stickers, and circus coloring books for kids. Read the AP story. Lions, Tigers, and Bears: Oh, Why? While the flash and pageantry may seem appealing on the surface, circuses are one of the worst forms of animal exploitation. Many large, wild animals are confined, abused, and moved around the country so the owners can make a profit on the novelty of training a one thousand pound brown bear to ride a tricycle, or intimidating a whole train of elephants to march in perfect formation. Tigers are forced to ignore their instinctual fear of fire in order to jump through flaming hoops. These are not natural behaviors, and often require the animals to receive extreme physical pain in order to “coach” them to do it right. Elephants in particular are subjected to flesh wounds from an implement known as a bullhook: a wooden handle with a sharp curve of steel attached. Trainers beat and stab the creatures for incorrect movements, until the desired action is achieved. The circus is a terrifying and painful experience for the animals involved, and the closing of Ringling Bros. and Barnum & Bailey is a big step in the right direction. However, the fight is far from over and there is still work to be done to put an end to the industry entirely and to liberate these traveling captives. As of this writing, there are still many other circuses operating in the United States, with even more worldwide. So far only eight countries have banned the use of wild animals in circus acts. We want to see that number increase and the number of wild animals in captivity decrease. The good news is: you can help! First, don’t go to the circus! As ticket sales decline, these companies will no longer be able to sustain their operations. Voting with your dollar speaks volumes to animal exploiters and the closing of Ringling Bros. shows that they are indeed listening. Second, tell your friends and family why you no longer support the circus. Use your social media account as a platform to share information. So many people simply do not know what the animals go through before they’re brought before the crowd and the circus works tirelessly to hide the truth, because they know many people cannot stomach supporting the torment of such magnificent creatures. If we help others see the pain of the animals, many of them will have a change of heart and that takes even more money out of the pockets of the owners. If you want to do more than that, consider joining a circus protest. The Animal Rights Coalition and other animal rights groups organize safe, legal protests when the circus comes to town, and they are always looking for volunteers to be a voice for compassion and justice. Taking a few hours out of your day to hold signs with other animal lovers makes an impact on the public. What comes next for these animals once the train stops is another important factor, and another place you can lend your voice. There are sanctuaries and refuges designed to care for exactly these kinds of animals who lived their lives in these captive situations. 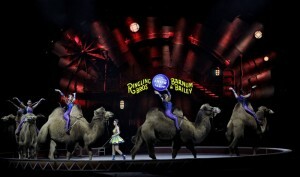 It’s yet unclear where the animals from Ringling Bros. will end up, but there is speculation that some will become research subjects. This is unacceptable and it’s on the public to hold this company accountable to their beasts of burden. After everything they’ve been through, these beings deserve to rest. Collectively, we can write letters to newspapers, call the offices of Field entertainment, owners of Ringling Bros. and Barnum & Bailey, and demand they release their animals to the hands of rescuers instead of researchers. We can also work to raise money for the sanctuaries, such as The Wildcat Sanctuary here in Sandstone, Minnesota, who often take in large cats rescued from abusive situations. It was the relentless efforts of activists around the country that helped shut down the largest circus for good, and our continued efforts will continue to make a difference. We celebrate this victory and we keep pushing for the next. The animals desperately need our help. Will you join us?